By default, the entries in the fi le dialog box are sorted alphabetically. It would be better if the last edited documents are right at the top in the list. Just like in the Windows Explorer, the sorting sequence can be adjusted as desired in the fi le dialog boxes as well. However, that option is hidden. 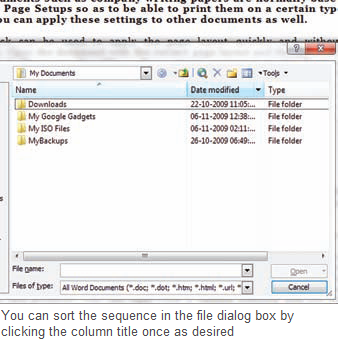 Click ‘File | Open’ in one of the Office programs. In the dialog box, click the arrow next to the ‘View’ tab and select the ‘Details’ setting. The column headings are now visible in the display area. Now click once or double-click the respective column heading to sort the display in ascending or descending order depending on this property. You can right-click a column heading and see the other properties via the context menu, according to which the list can be sorted as well. You can ‘Cancel’ the process without opening a fi le. The changed sorting sequence is then applicable in other Office programs as well, independent of the view setting selected there for the file dialog box. NOTE: In Vista, the necessary column heads are visible in every view. It can also happen that the particular settings have not been saved permanently.